Drone and Balloon Risk Management was founded by an aerospace industrial designer with worldwide experience, and a network of aviation first responders to protect and serve both civilians and operators of unmanned aerial vehicles. Our multi-generational team shares a combined fifty years of perspective and expertise in commercial airlines, military service, corporate and private business aviation, including pilots and engineers in their twenties to veterans of the Cold War. Out-ground-based mobile deployment saves operational costs with all-weather positioning for responding to downed craft or threats to security. R&D, operational overhead and logistic support is provided by www.KiwiAirHelicopters.com which also builds our unique self supporting all weather Trailer. On April 1,, 2015 www.americanavionics.com signed a strategic agreement to a Merger and Acquisition Providing a full FAA avionics services, equipment and partnership support. Worldwide deployment expected by Spring of 2016, and 5 USA preposition-ed responders in place by August 2015. 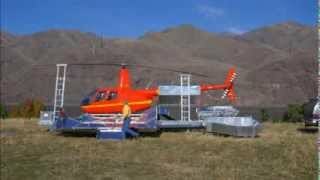 Strategic location on the Snake River in Washington State with FAA-approved heliports, maintenance, and other infrastructure, tours of Hells Canyon, and aviation services to mining, farm and ranch. Special event niche and cruise ships flights, Geo Cache events. M&A with American Avionics com. Contingency Planning Drone and Balloon recovery from Google X Project Loon, and Facebook Drones, providing WiFi platforms, aerial video and other remote sensing system data capture. Focus areas on critical infrastructure SMS to meet requirements in Public Operations. . Testing area security for Amazon and others in R&D and FAA Certification.